Welcome to our library of information, this will help you to learn about our key services, streghts and procedures. These helpful guidelines will give you a definite idea about our platform of expertise. These helpful guidelines will give you a definite idea about our platform of expertise. At Purple we always believe sharing knowledge helps you to increase knowledge. 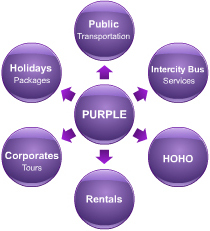 At Purple we always believe that sharing knowledge helps you to increase knowledge. Feel free to download, read and share with your social network. Corporate identity is generally perceived as an artwork of logo design, whereas a corporate identity is the "PERSONA" of a Corporation which is designed to accord with and facilitate the attainment of business objectives. It is usually visibly manifested by way of branding and the use of trademarks. Public transportation improves the quality of life in communities across the country by providing safe, efficient and economical service. Prasanna Purple, the official travel partner for ICC World Cup at Nagpur!!! Prasanna Purple Mobility Solutions, under its established brand Purple Metrolink, is the official travel partner for the ICC World Cup at Nagpur. 201/201 Mayfair Tower-I, Old Mumbai Pune Road, Wakdewadi, Pune- 411005.